The Unlearning Homophobia Series is a compilation of three groundbreaking films—Straight from the Heart, All God's Children, and De Colores. Each of the documentaries tackles the emotional issue of discrimination's effect on American families, communities, and churches. Anti-gay amendments or initiatives have passed in various states. Many people don't understand that these measures are NOT just about LGBT marriage. They affect hundreds of rights, such as hospital visitation, adoption, and medical leave. In all, these amendments strip the courts, cities, towns, and other government entities of any ability to protect LGBT and straight, unmarried families. Our films Straight from the Heart, All God's Children, and De Colores have begun thousands of discussions that have helped people understand the very personal impact of discrimination. The documentaries directly and specifically address issues of religion and homosexuality and specifically target three distinct church-going communities: White, African American, and Latino. Watch and share these films. 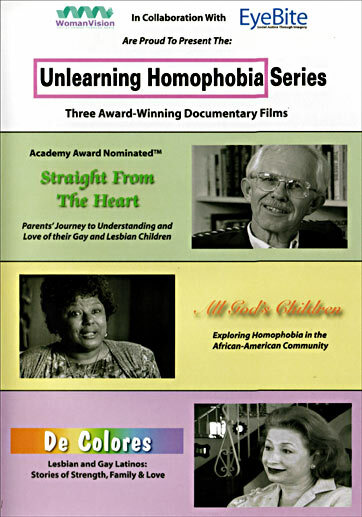 SAN FRANCISCO, September 2004 — Woman Vision and EyeBite Productions are proud to announce the release of the Unlearning Homophobia Series DVD, a one-disc compilation of three groundbreaking films—Straight from the Heart, All God's Children, and De Colores. Each of the documentaries tackles the emotional issue of discrimination's effect on American families, communities, and churches. "We had to act!" said Dr. Sylvia Rhue, producer of All God's Children and board member of the National Black Justice Coalition. "When Reverend Gregory Daniels, a black minister from Chicago, announced, 'If the KKK opposes gay marriage, I would ride with them,' from the pulpit, I knew that, now more than ever, we needed these videos that speak directly to church-going folks." All three films break through barriers and connect with our common experiences of family, love, support, and hope in overcoming rejection—especially by social and religious institutions. Sam Thoron, National President of Parents and Friends of Lesbians and Gays (PFLAG), said, "I have smiled, cried, and cheered the courageous men and women who told their stories." Straight from the Heart (24 minutes), explores the complex relationships between parents and their lesbian and gay children through simple stories about real people: a police chief who talks about his pride in his lesbian daughter, a Mormon couple whose son is believed to be the first gay man in Idaho to have died from AIDS, a black woman whose two lesbian daughters have been accused of "catching" their lesbianism from white people. The film was nominated for the Academy Award for a Short Subject Documentary in 1995. "I was inspired to make Straight from the Heart by one of several films that came out in the early 1990's called The Gay Agenda," said Dr. Dee Mosbacher, the film's producer and founder of Woman Vision. "It was a negative film full of lies and distortions. I wanted to do something different: I wanted to create a different path to provide food for thought." All God's Children (26 minutes) examines sexual orientation in African American communities. Politicians, religious leaders, academics, and family members address the human toll of the unspoken stigmatization and alienation of gay men and lesbians. In the film, the Rev. Jesse Jackson, Senator Carol Moseley-Braun, and Princeton professor Cornel West are among those leaders who call for spiritual reconciliation and a commitment to equal rights and social justice for all people. All God's Children was awarded Best Documentary in the 1996 National Black Arts Film Festival. The Rev. Paul Brown of Miles Memorial CME Church in Washington, D.C., called All God's Children, "a tremendous teaching tool," and, "an evocative and thought-provoking combination of art infused with spirituality. . . . It will stir emotions." EyeBite's debut film, De Colores (28 minutes), brings the viewer into the lives of families of gay and lesbian Latinos and Latinas as they struggle to accept their gay children. Ultimately, prejudice and fear give way to love and tolerance. De Colores won the Audience Award for Best Documentary Short at the Los Angeles Outfest, 2001. "The importance of culture and family relations is critical to an understanding of how homophobia can be dismantled," said De Colores director Peter Barbosa, co-founder of EyeBite. "These films are tools that bring light to an important aspect of our struggle." Davina Kotulski, author of Why You Should Give A Damn About Gay Marriage and director of Marriage Equality California, agrees: "The Unlearning Homophobia Series is a perfect package for activists, religious organizations, and schools to use in opening hearts and minds and bringing clarity to why our lesbian, gay, bisexual, and transgender brothers and sisters deserve our love and respect. . . . The series provides a fundamental stepping stone to make deeper discussions of equal rights possible." Discussion guides for each of the three films accompany the DVD to assist those using the films as educational, organizational, or outreach aids. This film is available for purchase through Frameline.